“There is no work in villages and rural people are suffering from severe food crisis. Many of them are crossing the international border into Bangladesh to collect forest products and sell them for a living. The new government has to take a stand on the issue”, Sarkar said. Democracy is being slaughtered in Tripura, former Chief Minister Manik Sarkar said here today. Accusing ruling Bharatiya Janata Party (BJP) of destroying democratic rights in the state, Sarkar, who served as Chief Minister for 20 years since 1998, told a press conference at CPI (M) state headquarters that individual rights, civil liberties and human rights are damaged under BJP rule. He alleged massive political violence on opposition supporters, especially those from CPI (M), and said ruling BJP activists are trying to silence the voice of opposition. “BJP grabbed power by hatching conspiracies and ploys. 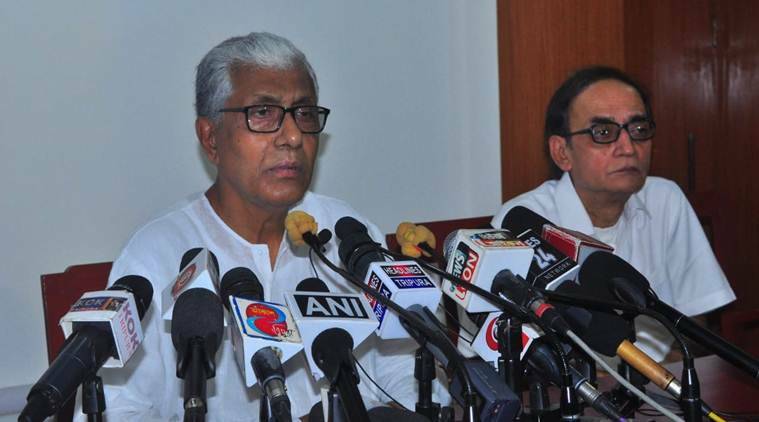 People are gradually realizing it now”, Manik Sarkar said and added that common people wouldn’t stay silent for long. On a series of clashes centering forthcoming three-tier panchayat by-polls, the former CM said, “Elected public representatives were forced to resign from their positions. Over 50 per cent of seats in three-tier panchayat bodies went vacant within 5 months of the new government. Bye-election was announced but opposition supporters were barred from submitting nomination papers. Those who collected nomination papers were attacked and their houses ransacked. This is an unnatural bye-election”. Out of 6,111 seats in Gram panchayat bodies across 58 blocks of Tripura, 3207 were rendered vacant due to mass resignation. Sarkar today claimed 3,148 of these were vacated by forced resignation. Similarly, 161 out of 168 vacant Panchayat Samiti seats and 16 out of 18 vacant Zilla parishad seats were rendered unrepresented by force, he claimed. The four-time Chief Minister appealed the BJP-IPFT government in Tripura to “restore peace” and ensure that people can exercise their democratic rights without fear. He also sought the State Election Commission to reschedule bye-election for panchayat bodies to make sure that all those who want to submit nomination and contest can do so. Earlier this morning, CPI (M) spokesperson Goutam Das said his party supporters were attacked and barred from submitting nomination papers for the panchayat by-polls, of which the last date for nomination submission expired yesterday. Meanwhile, BJP’s ally in state government – IPFT has also raised allegations of BJP sponsored attacks on their party members and demanded rescheduling of bye-election.